Even when you use SPF and take precautions in the sun (which you always should be doing, obvi!) it's still important to give your skin what it needs to heal and stay healthy! After a day at the beach I love to jump in the pool, it's so refreshing especially on a hot day! Post-being in the sun all day with layers of SPF and tanning oil, sand and salt water (and chlorine if you're like me) all over your body, nothing is better than a refreshing shower! It's so important to use a soothing soap for your skin, and especially so if you've gotten any sun burn. When it comes to cleansing, using a product that's not drying and soothing for your skin is crucial! Your skin needs lots of TLC after spending a day in the sun and my very favorite cleanser/body wash to use in the shower is the Brazilian Glam Nourishing Body Wash by Tone! It comes in so many scents and this girl looooves a good summer scent! I use it after every beach or pool day and it's extremely soothing. I use the Blissful Awakening Energizing Body Wash in the mornings - it has a vanilla/coffee bean scent and it's great for early mornings before heading to the beach. That's the one downside, leaving early to beat traffic for the beach, ha! Right after your shower post-beach, it's so important to moisturize your skin thoroughly! The Tone body washes are extremely helpful in making moisturizing simple and quick because they help soften your skin and maintain that glow! Between salt water and the sun beating down on you, your skins moisture quite literally is sucked right out. I *love* the Nivea In-Shower Body Lotion and how moisturizing it is. It's great because you don't have that sticky lotion feeling but you still get the moisture your skin needs after a day in the sun! Any body moisturizer you like to use works - as long as you apply it right after your shower so that your skin soaks in the moisture as you dry off. Whether you have sun burn or just a nice tan, the other product you need to moisturize your after-sun skin with is the Hawaiian Tropic Silk Hydration moisturizer. I talk about this stuff all the time (most recently it was in my Currently Cravings for June!) and I can't rave about it enough. It has cooling aloe in it and works great with the nourishing Tone body washes. 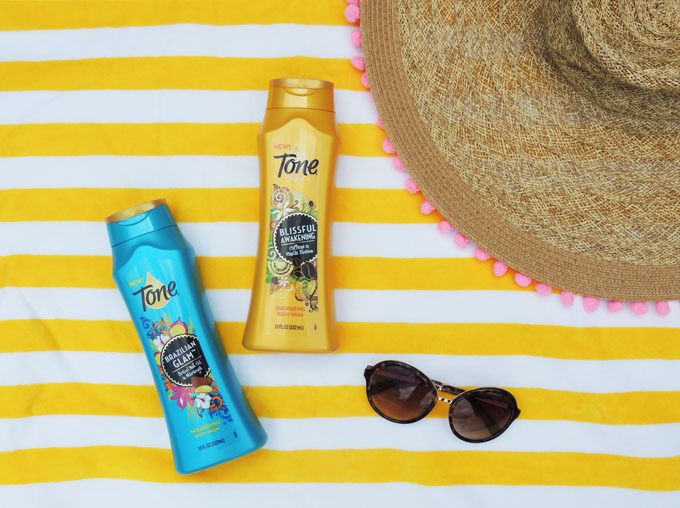 Just like your skin, your hair needs some love too after being in the sun! After washing, apply a leave-in conditioner (I loove this Moroccan Oil Hydrating Leave-In conditioner!) after de-tangling. Especially if you have longer hair! 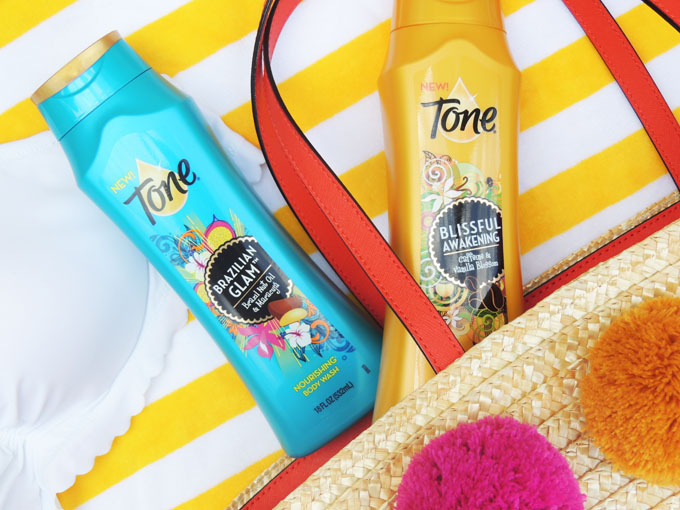 Hanging out in the sand in your cute new bathing suit may mean forgetting to drink lots of water, but once you're back home and have taken care of your skin with your new favorite body wash (seriously, once you try these out you'll know why I'm never going back to another wash again!) you can re-fuel with all of the water you need. And trust me, after being in the sun you need a LOT more than normal! Drinking lots of water and staying hydrated is also a great way to reduce the appearance of sunburn (I speak from experience, #sigh). It also makes you feel a lot better - that tired post-sun feeling is NO joke! A lot of us neglect our lips in the sun; meanwhile it's SO important to pay attention to them! Salt water, chlorine and sun alike can do damage to your lips. Find a soothing lip balm you love that works well and apply it every night - and an extra application when you've been in the sun. Thank you for sharing these products! I have been looking for some good sun skincare! I love you blog by the way! These look like they smell SOOOO good! 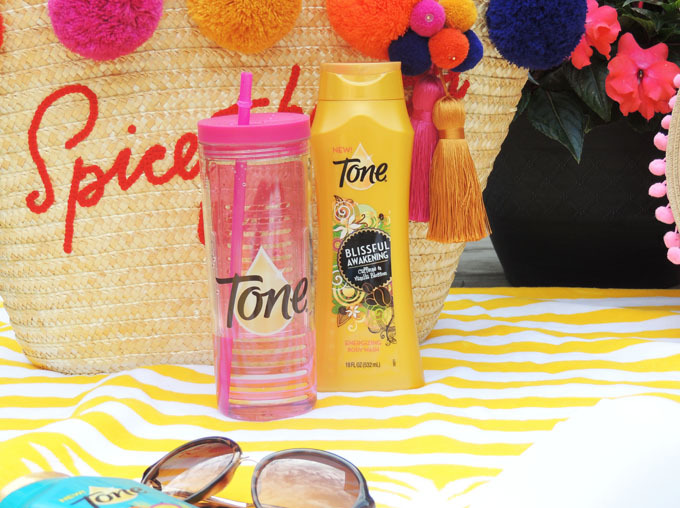 The packaging on these scream summer and I am all about smelling summery and staying hydrated! Where do they sell this product? This post makes me wish I was relaxing on the beach right now. Sadly, it currently pouring where I am! I'm all about that summer scent life! There's nothing more refreshing than that! Nice post. Skin care after sun exposure is so so important! Thanks for sharing. These scents are amazing! Love this brand! I just recently picked up the brazilian glam one and I love the scent! It smells so amazing! I've seen this stuff before but never tried it. I'll definitely have to check it out. i def always do something like this!! need to try these products tho! makes me wanna hit the beach!! Totally need to try this after the past few days in the sun! Thank you for sharing! I am getting ready for a beach vacation and will definitely need these! Sun skin care is so important! Also I love that straw tote. I'm always on the hunt for a good skin care product. Especially being from Southern California. I'll check out Tone - thanks! I've been really impressed with all of the Tone products. They are always so affordable and smell great! I haven't seen these on the shelves yet so I'll have to take a look this weekend while I'm out. Not only does the packaging remind me of summer, but these also look like they'd smell really good! I had never thought about a leave-in conditioner for my hair. Great tips! ahhh these are so cute! I love how summery they feel! I'm going to the beach for a week in August and I'm so excited! I always manage to get burnt though, so I know how important after beach skin care is. Currently at the beach so this is so helpful! 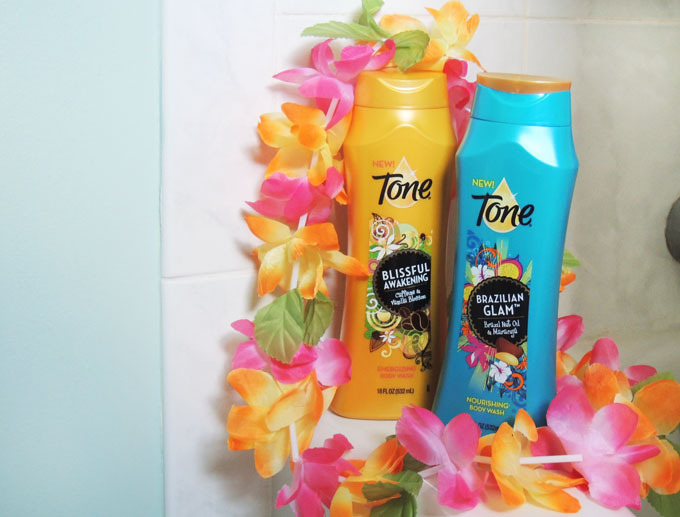 I have some of the Tone body washes already, but you're right it's so refreshing to hop in the shower after a full day at the beach! Sun can make so much damage! In my case if I'm not careful with my face... I get dermatitis very easily. I always like to treat my skin well after a day it the sun. Gotta try this brand! It looks amazing! So many smart tips! Thanks for sharing! I WISH I lived near a pool to hop into after the beach- so jealous! Moisturizing is probably my fave tip, but these are all so great! Yesss, such an important step! Love the packaging! It sounds great! Great Post from one beach lover to another. 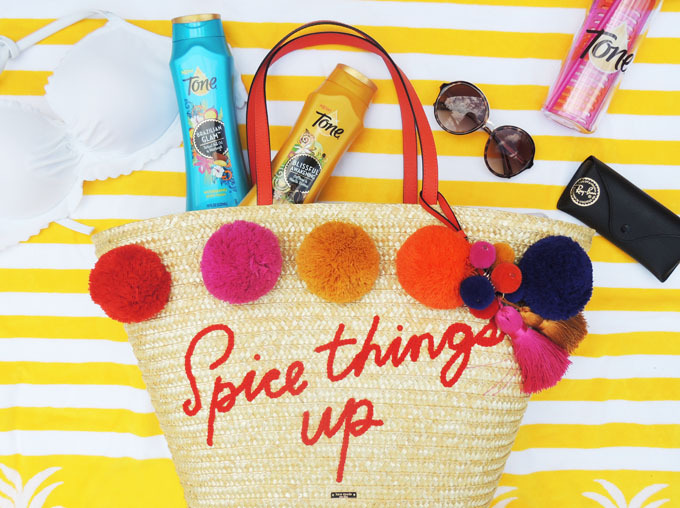 That pom pom tote is the cutest thing! That bag is the cutest! I love the packaging of those products too! We just got back from the beach, wish I had known about this product sooner! I definitely try to adhere to all these suggestions. It's so important to moisturize and hydrate after being in the sun, and I seriously swear by my lip balms so I have them everywhere - and most with SPF! Such great tips. I find it so important to hydrate after being at the beach. After sun care is SO important! I'm trying to be better at remembering to hydrate my skin! Amazing post. After a long day soaking in the sun’s rays it will thank you for taking care of a few basics. i really like it Gift to Pakistan .